Since establishing Twelve Arts in 2014 Beanie Hayward and her brother George have created an organisation that cultivates unforgettable spaces. The duo share a strong interest in embedding purpose and working on projects that have positive social and environmental impacts through their choice of artists and collaborators. 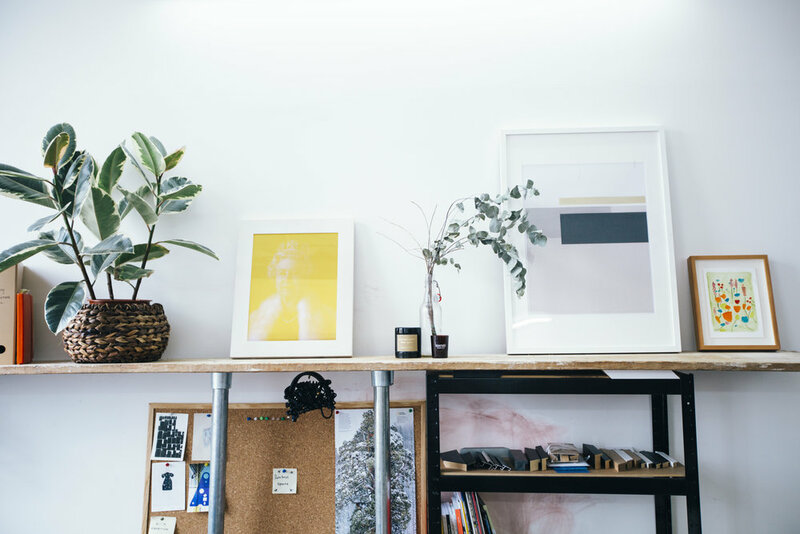 Their partnership with the Empire Warehouse, a hotel located on Southbank, highlights their drive to support local artists as they sourced works from Central Saint Martins students to compliment the interior design and rich history of the building and area. By offering a tailored and personal service that is categorised into three sections; Public art, culture and Event Experience | Exhibitions | Art Consultancy, they promote the idea; “Through great art and culture, we believe we can create great environments”. Each project is uniquely curated and meticulously planned to implement both a visual and sensory experience for the spectator. In the last four years, Twelve Arts have worked with some of the worlds most most recognised organisations and brands, from the BBC, Eden Projects and Christie’s to Glastonbury Festival and Soho House. Marguerite visited Beanie at the Twelve Arts head quarters; a light, open plan studio space on Dalston’s famous Ridley Road. During the visit, we learnt about Beanie’s interesting career path, which began in the music industry and subsequently transferred to the arts when she began working closely with the artist Chris Levine. Beanie’s in-depth knowledge around the importance of combining well-being and mindfulness with art gives insight into the positive steps that are being taken to embed strong messages on the importance of social and environmental change in order to preserve nature. Can you tell me a bit about your background? Have you always worked in the arts? I did Business and Marketing at university, nothing to do with art! I have always been very interested in music, so my first job in London was being a Band Manager. I worked in the music industry for 3 years at a small record label. I started off assisting in management then I found a band and managed them for 2 years. I got offered another job and in the process met a collector. Before I took the role I was asked to meet an artist who he had started collecting from - Chris Levine. This was in 2012. We got on really well, I think he liked the fact I had been in the music industry as he isn’t a traditional fine art artist - he works with a variety of mediums and collaborates with different artists and musicians. So we started working together and it developed into a great partnership and we made a dynamic team. I ended up managing him and running his business, which I have now been doing for 6 years. In that time we have worked on so many amazing international installations, shows and projects. You founded Twelve Arts with your brother - can you tell me a bit about the story behind how your business came to fruition? So following on from the last question, since managing Chris there came a natural conversation with my brother George, whose background is in producing events. He had worked in the festival industry on the production side. We both got excited about the same idea - embedding purpose into our business is something we are both passionate about - working in a business that has a social and environmental impact. So this idea of producing events and installations and working with artists that would have a positive impact seemed like the right thing to do. We founded Twelve Arts in 2014 and have been busy ever since! Would you agree that the property sector/the commercial industries have become far more conscientious about engaging with the visual arts and creative industries in recent years? Yes, at an ever-increasing rate. “Place-making" is the buzz word flying around now in the property sector. The involvement of artists and creatives is essential for the future make up of our urban areas. Not just for inspiring wall art and sculptures, but from a design and innovation perspective. A good example of this is LAGI (Land Art Generator Initiative), based in Seattle, who like us work with artists, architects, landscape architects, and other creatives to connect them with engineers and scientists. This enables forward human-centered solutions for sustainable energy infrastructures that enhance the city as works of public art while cleanly powering thousands of homes. Much like this our focus is to help the property sector and commercial industries engage with artists/creatives at the earliest stage of a project. In doing so we help our clients find the right artists/creatives for a site and as a result deliver really engaging projects. We have plans to work with LAGI in the future. Our mindset is a collaborative one so we want to help similar organisations to ours and work with them to make these projects happen rather than compete with them. Are there any public art funds/projects/organisations that you credit for their innovative programmes? Yes. LAGI, who I just mentioned have a fantastic programme. Bow Arts are also brilliant. They are currently showing the exhibition ‘Arts for the Environment’ which presents work from six artists with practices that explore the nature of human impact on our environment. Their innovative programme invests in artist and designers who explore concerns that define the 21st century including sustainability, social economy and human rights. Does the architecture of space come into a lot of the work that you do? Yes, very much so. We also find building a story around the architecture of a space through art helps people engage more within their communities. We work with artists such as Laurie Nouchka. Laurie has developed walls on walls, a creative project that works with developers and brands to bring community engagement to an area through art. These spatial artworks are created on site specific exterior walls, temporary hoardings, meanwhile spaces, retail spaces and interiors. Her most recent large scale commission from Camden Council is a series of vibrant, permanent wall installations across a number of housing estates which tell the story of the changing local landscape through art and sound. Is there a particular area that you enjoy working in most? I love working with Chris Levine. We are lucky that we have such a strong working relationship. Its been exciting to see how his work has developed but also his career and the impact this has had on people in the last few years. A lot of his practice is about meditation, contemplation and bringing people into a state of stillness. I think now more than ever this is resonating with people - its really exciting to see such positive changes in our attitudes towards self care and well being. Are there any Twelve ArtS projects you have worked on that resonate with you most? Yes - Iy_project: The Nature of Light and Sound; an immersive light and sound installation developed by Chris Levine in collaboration with EdenLAB - Eden Project’s international creative partner. Iy_project defies categorisation. It is an experiential art work which aims to remind us that we are a part of nature, not apart from it. This is progressive art that celebrates the wonder of life on Earth and our connection to it. The Iy_project in Hastings was very special for me. It was in October 2016 - freezing and really rather bleak. Chris was given the end of the pier to implement a powerful nine-point laser system along the coast that created a geometry and on top of this we had 3D amber sonic sounds. This created a capsule of sound that the spectators were inside - a ceiling of light so to speak. It was pouring with rain but the 4000 obsessors stayed for the 4 hours - it was very special. Can you tell me about some of the projects you will be working on in 2018? Chris Levine will have a solo show during Frieze week, which is titled : ‘Inner (Deep) Space'. It will be hosted in an amazing venue right off Regent Park. I can't tell you everything but I can say it will be an immersive, meditative light experience and it will be a place for people to take refuge during the madness of Frieze - offering a space for contemplation and meditation. You appear to collaborate with a number of organisations - from Sotheby’s to Glastonbury - are there any in particular you have enjoyed working with most? It varies so much. They have all been completely different. One of my favourite projects and an organisation that I respect massively is the Office of Tibet. Chris was commissioned to do a portrait of the Dalai Lama to celebrate his 80th birthday in 2006. Levine is the second artist to have done this, Annie Leibovitz was the first. All the proceeds have been donated to charities working with communities affected by the earthquakes in the Himalayas.. It was an amazing experience and has also allowed us the opportunity to work with Action Aid. How did you come across Marguerite? My friend Georgina Borthwick, Director of Corporate Partnerships at The Cultivist, introduced me and I’m very happy she did! Can you summarise in 3 words what being part of Marguerite means to you? If you could invite four artists to dinner who would they be? I've really enjoyed this question. Ansel Adams for his extraordinary way of capturing the vastness of nature in photography, particularly of Yosemite. I saw his show at The National Maritime Museum in Greenwich in 2012 and fell in love with him. I was then in Yosemite two years ago with a friend and saw for myself what he had been mastering the art of for years. I bought a poster of 'Moon and Half Dome' which I look at every day in my flat. John Muir, has to come with Ansel Adams, environmental philosopher, glaciologist and early advocate for the preservation of wilderness. I know not an artist in the traditional sense of the word but an artist of words and naturalist writing. Richard Long, in keeping with the theme of our relationship to the earth and nature, his show last year at Houghton Hall was beautiful and 'A line made by walking' remains one of my most memorable pieces of art. Finally, James Turrell for his sky spaces, more nature chats!! And, I could sit in one of those for days. If you could own one piece of art what would it be? I would pick Gerrard Richter’s ‘Sea Scape’ which I saw at the Tate years ago. I could look at it forever. It is all about our relationship with nature - our insignificance and how powerful it really is. I sat in front of this work for a very long time and would like to wake up to it every morning.